We are striving to make impact in our community by assisting the homeless and other members of our community. The reason we chose to do a Laundromat Takeover is to help those that ordinarily do not have the funds to do the small things such as washing their clothes. 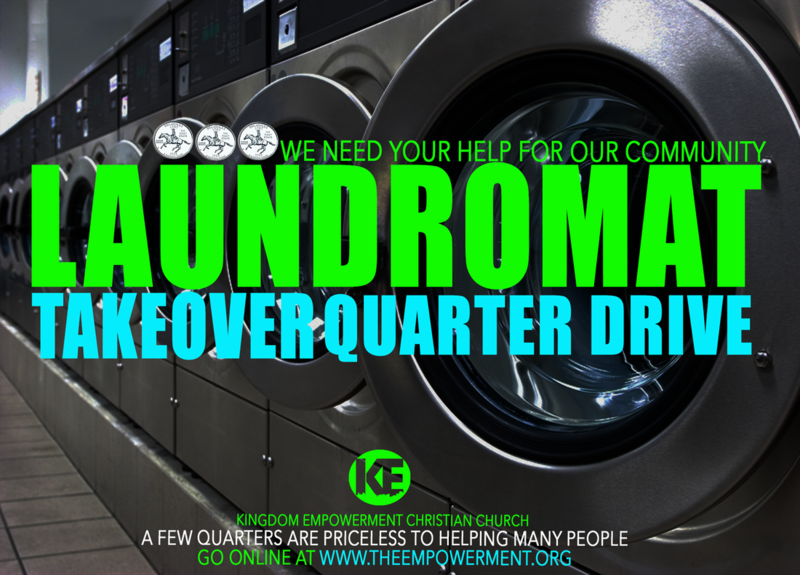 We are asking for donations of quarters and laundry supplies to be brought so that we can make the most impact in this immediate need! Our goal is to insure the homeless population in our community can come wash 2 loads of clothes, receive a meal and a survival kit, and be ministered to. We are a 501(c)3 Non-Profit Organization. Your seed is used to advance the Gospel of our Lord and Savior Jesus Christ. We are honored that you give to the vision of this fellowship.You can also give your tithes and offering through this link. You can also bring your donation to any of our scheduled services in our Seaford Location: Sun 10am Wednesday at 7pm 22606 Sussex Highway Seaford DE 19973. If you cannot make it to one of our services, but you would still like to to donate you can mail you gift card to our mailing address: Kingdom Empowerment Christian Church PO Box 564 Seaford, Delaware 19973. This donation is tax deductible and we are a 501(c)3 Non-Profit Organization.